When it’s especially chilly outside, sometimes all you really need is a warm, sweet little treat to make you forget all about winter. Here is a tasty dessert recipe that takes only 15 minutes to prepare, bakes in about an hour, and is best served warm out of the oven. Short on granulated sugar? No problem! Check out Honeyville to restock your pantry without ever having to brave the cold. There’s a good chance that if you do much baking at home, you already have most of what you’ll need on hand. Just in case though, you can find the following ingredients for this delightful winter dish at places shop.honeyville. The fresh lemon is an option for those who prefer a stronger flavor, but you’ll still get plenty of great citrus taste even without it. Not a big fan of lemon flavor? Substitute in yellow cake mix and vanilla pudding for the first two ingredients, and you’ll be on your way to a divine dessert! You will also need non-stick cooking spray, a 13×9” baking pan, and a baking sheet which is a bit larger than the pan itself. Otherwise, things could possibly get a bit messy inside your oven. This delicious lemon cake is a favorite of many home bakers (and their families) thanks to its quick, simple preparation—and of course, the yummy results! Follow these easy steps, and then let your oven do the rest. Next, prepare the cake batter per the manufacturer’s instructions. We recommend using Land O Lakes butter and eggs. Pour the resulting mixture into a greased baking pan. Optional: Add the zest and juice from 1 lemon for a stronger citrus flavor. Beat the dry pudding mix, sugar, milk, and water with a whisk for 2 minutes. Pour the mixture over the cake batter in your baking pan. Place the pan onto your baking sheet, which will catch any potential overflow which may occur during baking. Bake for 55-60 minutes, or until a toothpick inserted in the center of the cake comes out clean. Remove the cake from the oven and let it stand for 20 minutes to cool, as well as to allow the sauce to thicken slightly. Sprinkle your cake with powdered sugar and serve warm. Optional: Top with fresh raspberries for a fresh, tangy blend. That’s all there is to it! 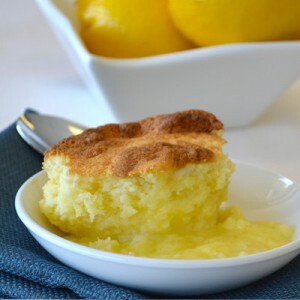 This lemon pudding cake is a perfect treat for after dinner, or any time you need a sweet pick-me-up during the day. It is great paired with coffee or tea, especially on those blustery days when you just want to stay inside and curl up with something warm. In the off-chance that you end up with any leftovers, just pop them in the fridge. Then you can enjoy your next serving chilled, or reheat in the microwave for a few seconds if you’re craving something hot! Wow, what a cake. Long to eat it. Thanks for the post. This cake looks so inviting. Can you give me a bite now? Thanks in advance. Really nice to see the dish but Shall you post step by step procedure image.